The Kunstkabinett, known as a cabinet of curiosity, housed the privately owned collections of rulers, aristocrats and scientists, and were used to show wealth and power in Europe during 16th Century. With this in mind, Frieze blurred the boundaries between the public and private sectors, bearing no resemblance to former or contemporary exhibition principles. This led me to believe the fair was not aimed at the public at all, but at the buyers. There was a strewing of diversity in the works, which have no descriptions or context attached; a high-class charity shop whose space was just as difficult to navigate, unless you have a strong military approach to piloting isles. Even then the space is fragmented with other works, invading the middle ground leading your path astray. Space layout and exhibition design have a tremendous impact on audience perception. A buyer can simply locate any artist’s work they wish to buy in the guide, view a few areas, and manage to stay focused. On the other-hand the public will most likely want to view everything, yet they will find the space overpowering; it is too easy to become distracted, ultimately missing large parts of the fair. If it were even microscopically aimed at a public audience there would be wall descriptions of the work in order to gain some knowledge of the work and the artist. There are curators to talk with, yet they appear bias, in that once they realise you are not interested in buying, they will in turn flee, leaving to talk with the next person. Even so, their role is not to enlighten you on the concepts of the work or the history of the artist, but to sell it to you, making their demeanour completely different to that of a curator in an institutional setting. A museum’s original role is to produce research and distribute and publicise knowledge for a wide audience. You could describe Frieze as a ‘Kunsthallen’, a temporary exhibition space, but even this category does not fit. Its function is simply to show gallerists recent signings and profitable works. Frieze art fair is all at once a bizarre and unbearable space to be in. It is uncommunicative yet utterly eye-opening to art from all over the world. I do not consider it an exhibition; it is a fair wholly and shows the distinction between the scripted gallery space and that of the frieze art fair. 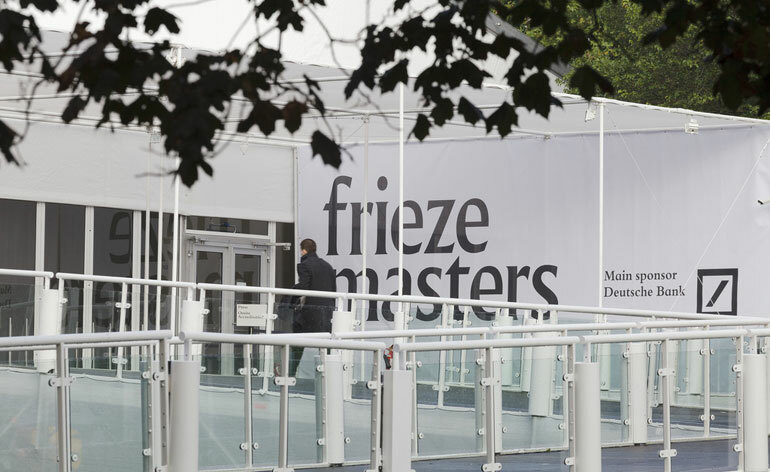 Yet history has always been clear in terms of the public and private sectors and frieze art fair is one place where those boundaries become magically blurred. This is at once wholesome and also existential to the twenty-first century, yet incredibly tedious. If you are going to make something public, could you at least make something that the public can take away from the exhibitions themselves? Whether it is new knowledge on an artist from a wall text or some illuminations on concept, form, genre or styles packaged in an informative booklet. And don’t even get me started on the prices. ← CTC hit Frieze Art Fair last week!